These Mercy Housing kids were very excited to get their brand new bikes! 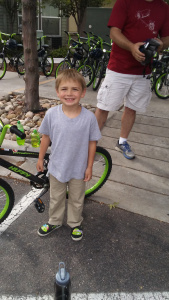 Thanks to the BCER Group and Wish for Wheels, two Colorado organizations, dozens of children living at Parkside Apartments in Denver, Colorado now have bikes! 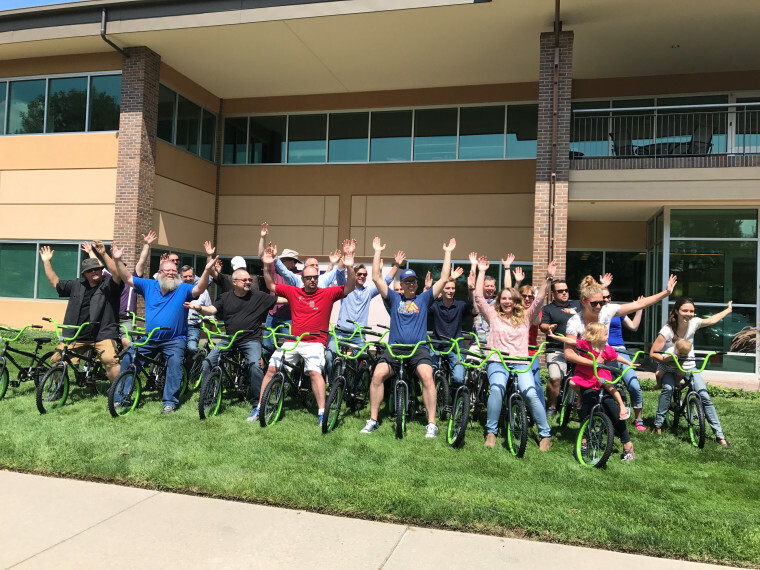 On August 11, 2017, BCER Engineering, a Colorado-based engineering firm, partnered with Wish for Wheels, a nonprofit that gives bikes to kids from low-income families, to build 25 bikes for the children living at Parkside Apartments, a Mercy Housing community in Denver, Colorado. Parkside Apartments provides 68 affordable apartment homes and Resident Services to families with low incomes. The BCER Engineering employees met in the morning to do a “team build” with Wish for Wheels. BCER built the bikes in teams of two with one person blindfolded and the other giving instructions. After they built the bikes, BCER Engineering employees and Wish for Wheels delivered them to Parkside Apartments. BCER Engineering employees helped Wish for Wheels distribute helmets, adjust the bikes’ seat heights, and made sure the kids knew how to ride safely. The bikes will encourage the Mercy Housing kids to exercise and spend time outside. As the Centers for Disease Control and Prevention (CDC) notes, regular physical activity can help youth build strong muscles and bones, control weight, reduce symptoms of depression and anxiety, and reduce the risk of developing health conditions like cancer, type 2 diabetes, and heart disease. Many thanks to the BCER Engineering employees, Wish for Wheels, and the committed Mercy Housing staff for bringing bikes to these inquisitive riders! BCER Engineering is a full service firm offering engineering and design including construction and start-up services for commercial, institutional, industrial and governmental clients. Their principals have over 100 years of engineering work experience combined. They provide full-service: mechanical engineering, electrical engineering, life safety consulting, fire protection engineering, tenant group, technology engineering, and sustainable design. To learn more, visit their website at bcer.com. 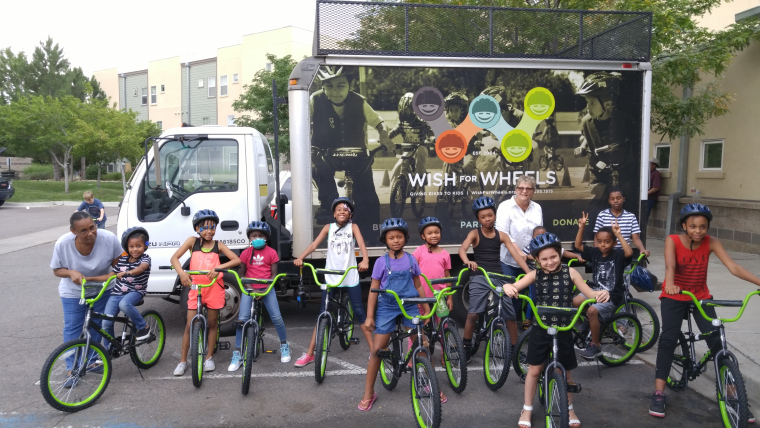 Wish for Wheels is a 501(c)(3) nonprofit organization that gives brand new bicycles and helmets to kids in low income communities. Founded in 2004, their first giveaway made it clear that the bikes bring health and happiness into kids’ lives and for that reason, they are committed to making a difference. Their unique model bundles corporate philanthropy, team-building, and employee engagements through bike builds, to deliver brand new bikes to kids in the community. They are successful thanks to the generosity of their corporate partners and volunteers in the community. To learn more about Wish for Wheels, visit their website at wishforwheels.org. Mercy Housing, Inc. (MHI), is a leading national affordable housing nonprofit headquartered in Denver, Colo. Established by the Sisters of Mercy in 1981, and in operation in 41 states, MHI has 35 years’ experience developing, preserving, managing, and financing affordable housing. MHI supplements much of its housing with Resident Services, programs that help residents build stable lives. MHI’s subsidiaries further the organization’s mission: Mercy Housing Management Group (MHMG) offers professional property management and Mercy Loan Fund (MLF) finances nonprofit organizations. MHI serves tens of thousands of people with low incomes, including families, seniors, veterans, people who have experienced homelessness, and people with disabilities. Its mission is to build a more humane world where poverty is alleviated, communities are healthy, and all people can live to their full potential. To learn more about MHI and the services it provides, visit mercyhousing.org.